Watering is the most essential part of the process for successfully establishing newly planted trees & shrubs. During and after planting, all plant material should be thoroughly watered on a regular basis . If plant material is not installed right away, it will need to be checked for water daily. NEVER rely on rainfall or lawn irrigation and a void overhead watering whenever possible, as this can lead to foliage problems. To water properly, lay a hose in the basin (the tamped – down area around your plant) and turn the water on to a trickle, about the size of your little finger. The water should run from 30 minutes to 3 hours depending on the size of the root ball. Be sure to water the root ball, as well as the surrounding soil area. Watering newly installed plants should be done on a regular basis, however NOT every day. Between waterings, the soil should be allowed to dry down 1-2 inches. This may take several days and will be weather dependent. If it is sunny, windy and hot, you will need to water more frequently than if the weather is cloudy and cool. The only sure way to tell if your plant needs water is to stick your finger in the soil. If the soil has dried down 1-2 inches, it is time to water again. Be careful not to over-water, as this can lead to root rot and the eventual collapse of the plant. Plants will need to be irrigated until they are fully established, which may take anywhere from 1-5 years. After a plant’s first year, the frequency that you will need to irrigate decreases but the duration should stay the same. Remember that larger plants require more water and will take longer to get established. Each watering should be deep and thorough. Watering should take place up until the ground freezes and start again as soon as the snow thaws in the late winter/early spring. The winters can be challenging for newly installed plants and watering as soon as possible after winter is often the difference between a plant thriving and dying. As plants start to become more established, water the drip line area (The area just beyond the reach of the crown) which will encourage roots to grow out into the surrounding soil. We also recommend 3 applications of Root Stimulator, each 1 week apart. Start -N-Grow or Bio-Tone is the perfect complement fertilizer and is easy to apply. If you have further questions, please call us at 603-886-5200. 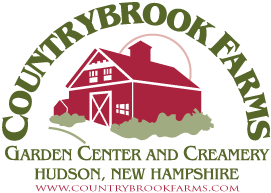 COUNTRYBROOK FARMS will warranty to the original purchaser the survival of trees and shrubs for a full three (3) months from the date of purchase at 100% of the purchase price of that plant. Our warranty is limited to replacement of the plant or a store credit in the amount of the purchase price of the plant material, but not a refund in the amount of the purchase price. The cost of labor and delivery are not covered under this warranty. We recommend our customers purchase Root Stimulator and Start-n-Grow fertilizer at planting time to help ensure the successful establishment of the newly planted material. This warranty does not cover the following: Annuals, perennials, vegetables, herbs, hanging baskets, fruit trees, roses, sod or vines. There is no warranty in case of damage due to abnormal weather, insects, disease, negligence or abuse, branch dieback or breakage on your property, failure to blossom, winter damage or other acts of nature that we cannot control. Plants which die during summer due to lack of water caused by water bans or other watering practices are not covered under this warranty. We do not warranty transplanted plant material or trees and shrubs sold at 40% off or more or final sale items. This warranty is void without a receipt or without any record in our database. DO NOT DIG UP YOUR PLANTS UNLESS INSTRUCTED BY COUNTRYBROOK. We are a family owned, full-service garden center with over 8 acres surrounding our 150-year-old New England style barn. Bring your whole family for a visit to see our animals & indulge with our locally made ice cream!